SilverStone has just introduced the new “Lucid” series of cases, and the LD01 is the first case in this series. 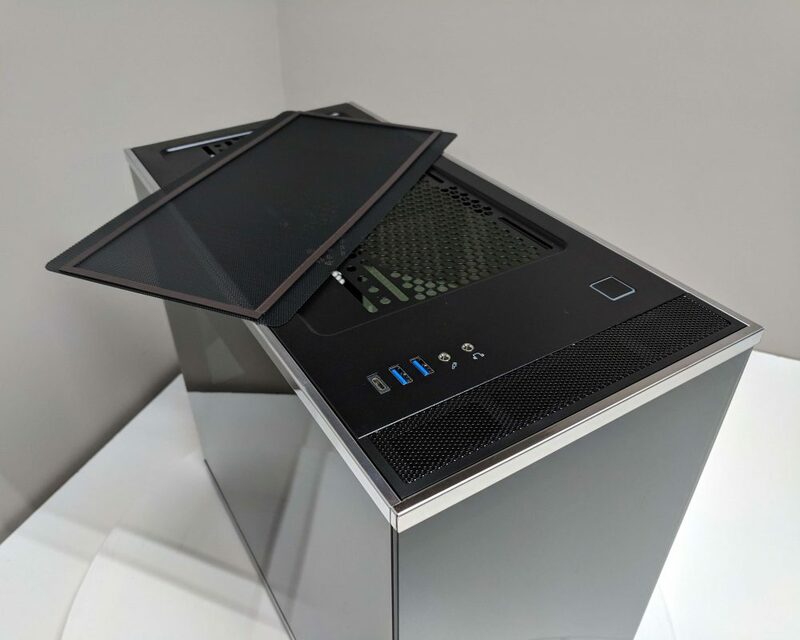 The LD01 is a mid-tower case featuring tempered glass panels on three sides with a steel frame chassis and sports an inverted motherboard layout for improved GPU temperatures. 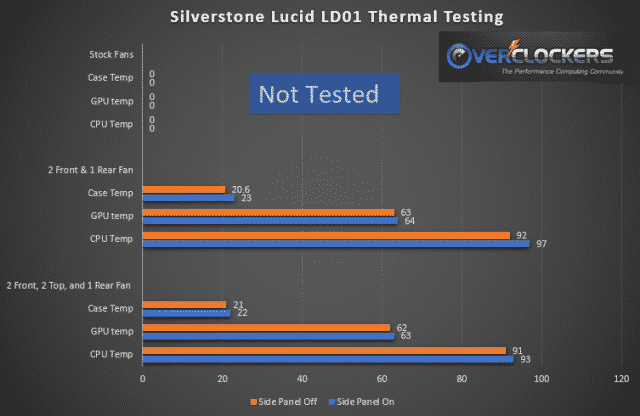 Here is what SilverStone has to say about the Lucid series and the LD01. Here’s a list of the specifications per the SilverStone website. 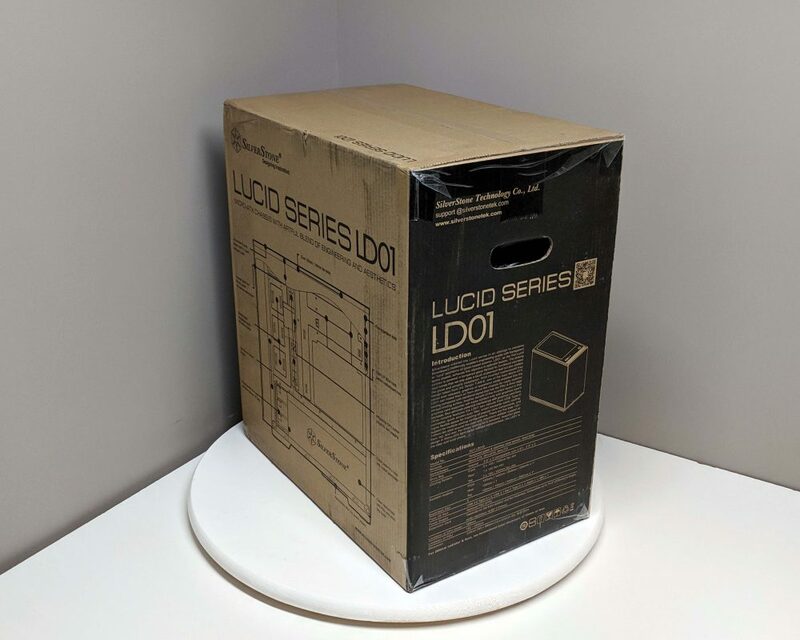 The Lucid series LD01 comes shipped in a brown cardboard box with black print. On the front of the box is a large isometric view of the case along with the model number and an overview of the features. On the right side, the features are listed in multiple languages, while the left side of the box prints the introduction and specifications that were just presented above. On to the back, the series and model number are clearly identified, as well as a diagram of the many features of this case. Opening the box we find the case wrapped in the traditional plastic bag and surrounded at the top and bottom with Styrofoam caps. 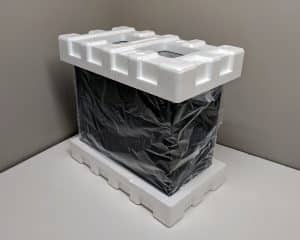 This is how most cases come shipped these days and is effective in protecting the enclosed product. 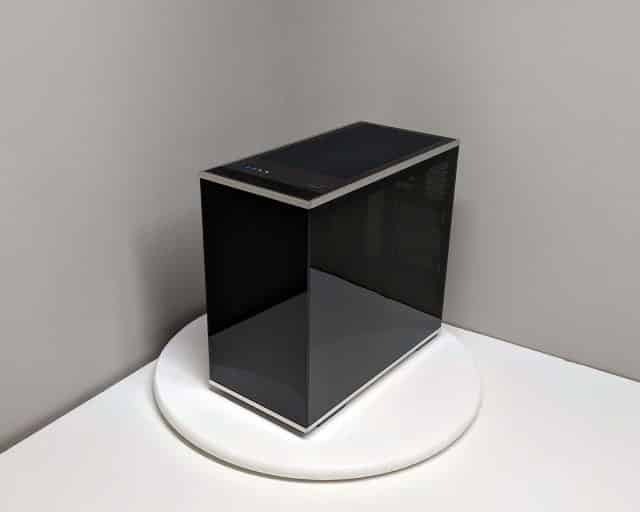 The tempered glass panels are also protected by a plastic film to prevent any scratching during the shipping process. 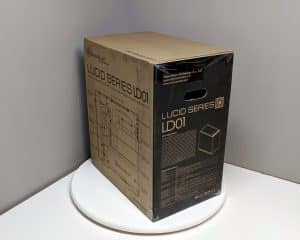 In addition to the chassis itself, there is little the LD01 comes with. 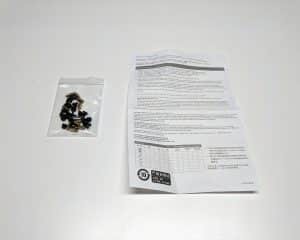 A bag of assorted screws and a warranty card are all that accompany the case. The SilverStone Lucid LD01 represents simple elegance and sophistication. Its all-steel chassis is surrounded on three sides by heavy tinted tempered glass panels and chrome trimmed stainless steel trim pieces. 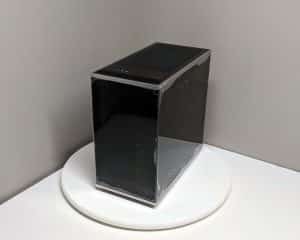 The front, left, and right are completely enclosed in a dark tempered glass. 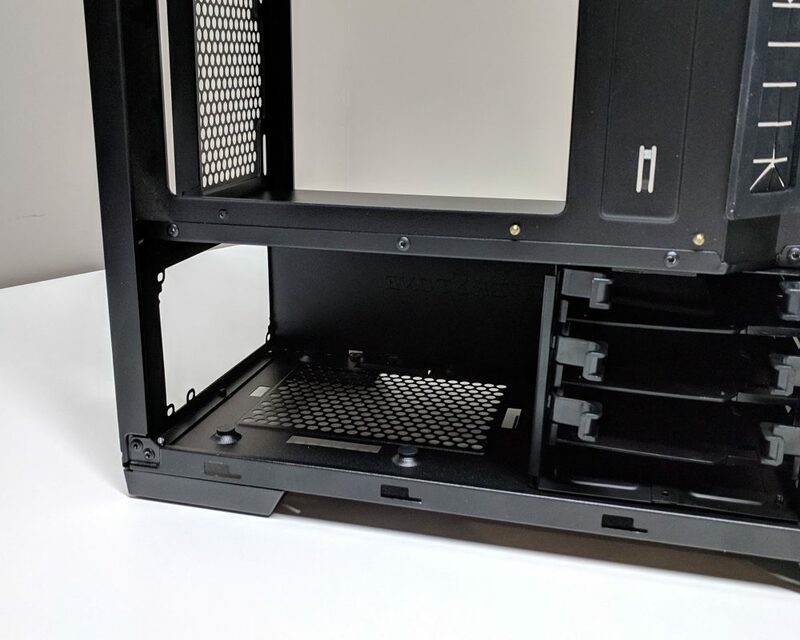 Without any internal lighting, it is very difficult to see inside the case. All three panels are trimmed at the top and bottom with chrome trim pieces that add an elegant touch of class. The two side panels are retained using a pair of black thumb screws. 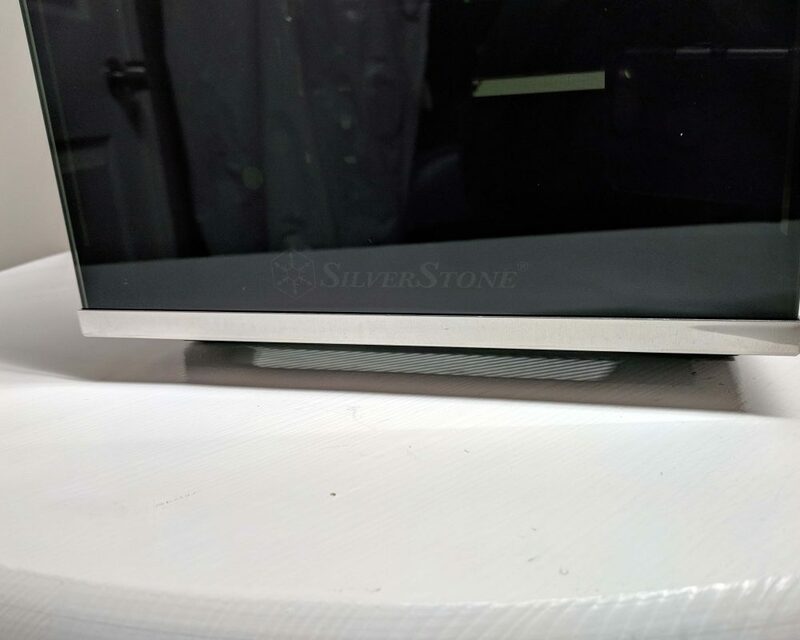 “SilverStone” is printed at the bottom of the front panel and is easily missed if one does not specifically look for it. At the back of the case is where the inverted motherboard layout is most recognizable. Starting at the top there are five ventilated expansion slot covers. Just below the slots are the motherboard cutout and a spot for a 120 mm rear exhaust fan. Finally, at the bottom of the rear is the location to mount a standard ATX PS/2 power supply. The power supply can be mounted with its intake fan at the top or bottom. Starting at the front of the top is a small mesh intake area for the front fans. We also see the USB 3.1 Gen1 Type-C port, two USB 3.0 ports, headphone and microphone jacks, and the illuminated power button. 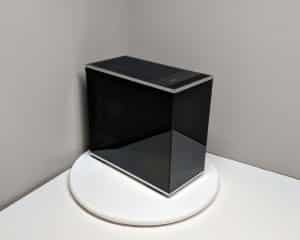 The remainder of the top comprises of a large magnetic fine mesh filter. Looking at the bottom with the front of the case to the left is an opening to grasp and pull the front panel off. 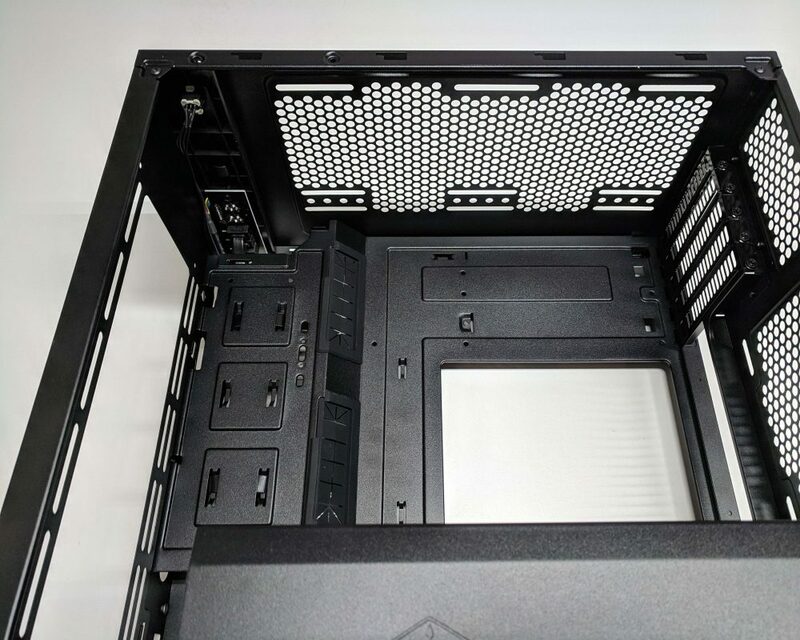 This opening will also act to allow additional air to the front fans. All the way to the back is the fine mesh PSU intake filter. The last feature to discuss before digging into the details are the four block style feet with rubber pads. 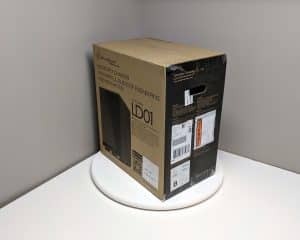 These pads are slightly smaller than others we’ve reviewed, but for a case of this size and weight, they prove to be adequate. At a glance, this case looks to be an excellent choice. The styling appears to have the class of a limousine. Now, let’s see if it’s as functional as it is beautiful. As this case has an inverted motherboard layout, the right panel will be the first to be removed. To do this just unscrew the two non-captive thumb screws. Notice that the chrome trim wraps around to the back of the case. This allows for a maximum amount of glass for the side panels. Flipping the right side panel around we can see the tabs and slots that lock it in place. 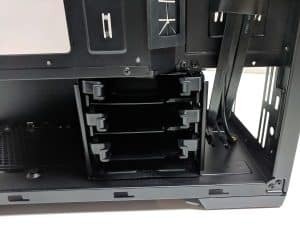 Looking inside and towards the front, we see an area with cable tie downs for the back of the motherboard tray. This is the area reserved for fans and a radiator of up to 240 mm. There are two large cable pass through holes with grommets and a plastic wedge piece that is there to support the GPU. Further back is nine standoff holes for mounting the motherboard. There is also a large opening for accessing the back of the motherboard to mount CPU coolers. At the top of the right side is where one can mount fans or a radiator. The fan options are up to two 120 mm or 140 mm fans while radiators can be up to 240 mm or 280 mm. All the way to the back, starting at the top, are the five vented expansion slots. They feature a standard Philips head screw for securing PCI cards. Adjacent to the expansion slots is a small area for additional ventilation. Further down is the motherboard cutout and a location for a 120 mm exhaust fan. The mounting holes for the rear fan have 22 mm of vertical adjustment. At the bottom of the right side is a large, fixed position PSU shroud. It features a grommeted cable pass-through hole and the SilverStone branding. Rotating the case around we remove the left panel in the same manner as the right side. From the back side of the case starting at the top is the dual 2.5″ SSD mounting plate. This plate is secured by a single screw and two tabs. Towards the front is the section that is responsible for routing the bulk of the cables. This seems quite adequate. We’ll take some measurements once the build begins. At the bottom of the left side and to the rear is the PSU bay. There are four rubber bumpers for the power supply to quietly rest upon. To the front is a triple stack HDD caddy. This caddy can be positioned into one of three locations. Where it sits currently is for the front radiator and fan clearance. It can be placed all the way forward for longer power supplies or sit in the middle for a compromise of front fans and longer PSU clearance. Sadly the HDD caddy is not removable since the chassis frame and fixed PSU shroud prevent it. Rounding out the left side, let’s take a close look at the top I/O cables. There is a high definition audio connector for the headphone and microphone jacks, a 20-pin connector for the type-C USB port, another 20-pin USB connector for the dual USB 3.0 type-A ports, power switch, and power LED positive and negative connectors. 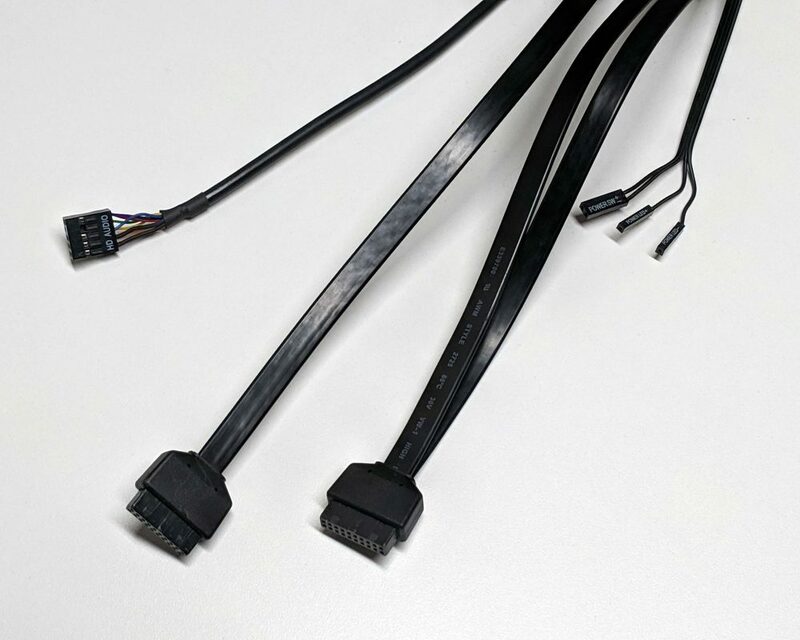 It’s a shame that the type-C connector is only a 3.1 Gen1 and not the newer 3.1 Gen2. SilverStone also opted to use a 20-pin connector here. Many micro-ATX motherboards only come equipped with a single 20-pin front USB connector. 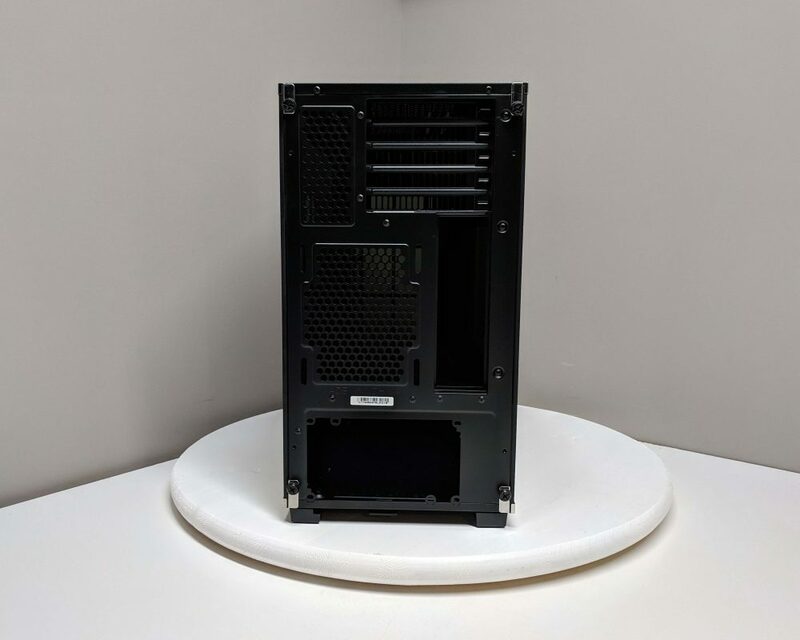 With this being SilverStone’s latest case, one would expect the most current connectors to be used. The front glass panel is removed in the traditional means. Simply grasp the bottom of the panel and pull and it is released. With that set-aside, we get our first look at the front intake filter. 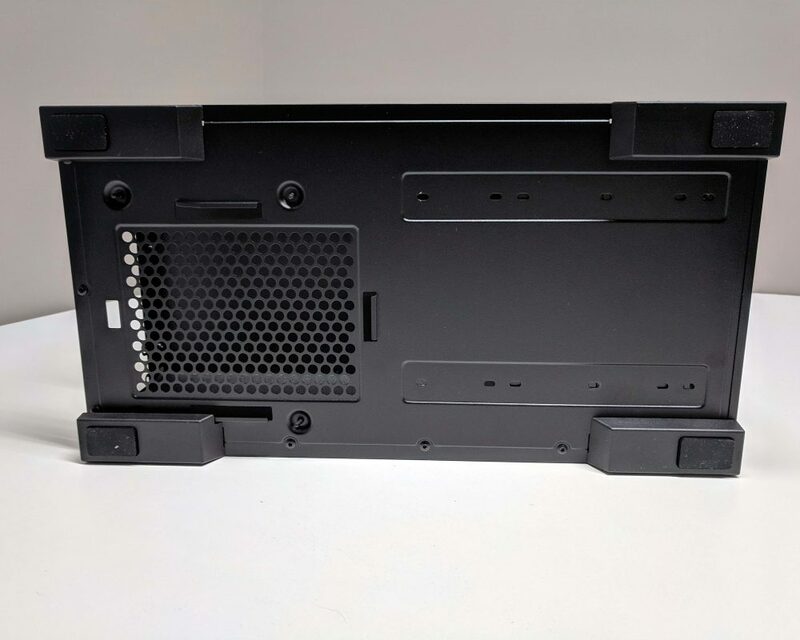 Although it does not run the full height of the front of the chassis, it does appear to be of adequate size for the fans one would place here. 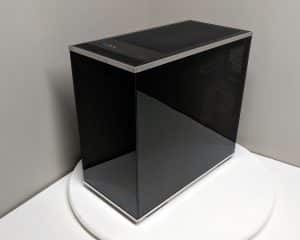 This is a fine mesh filter that will do a good job of keeping most dust particulates out of the case. There is a handle on the left side of the filter and a slight tug releases the plastic tabs that hold it in place. Here we can see the four columns of slots for either 120 mm fans or 140 mm fans as well as a fair amount of adjustment. 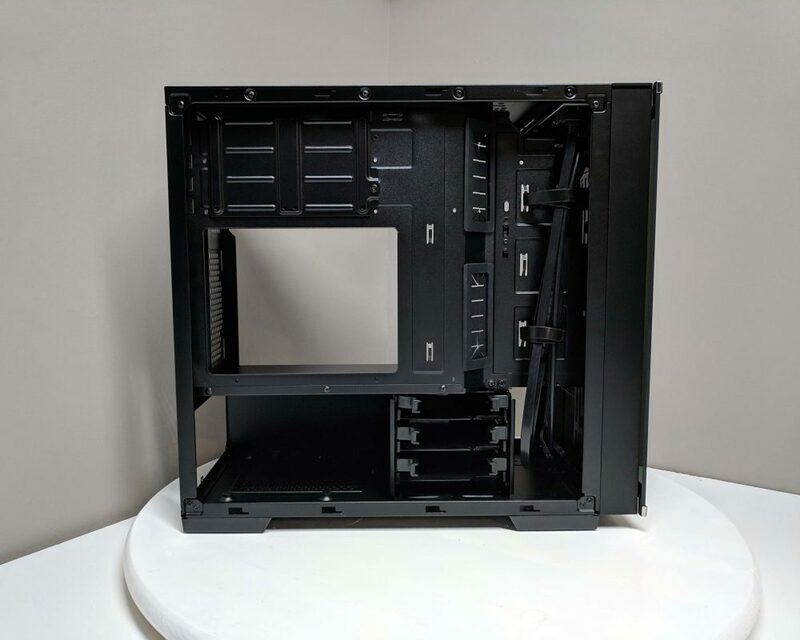 With this case, the top panel is not removable as it is a part of the chassis structure itself. The top mesh panel is held in place by four magnetic strips. 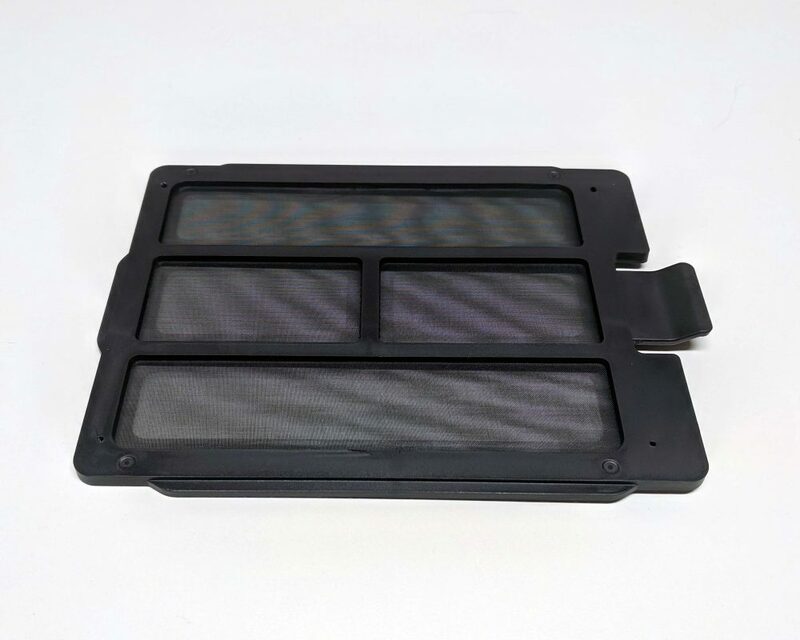 Removing this filter, we can see the three rows of slots for attaching fans or radiators. At the bottom is the fine mesh PSU intake filter. Pulling the filter out we can see the large steel mesh opening. To the right of this or the front of the case, are a series of small slots. 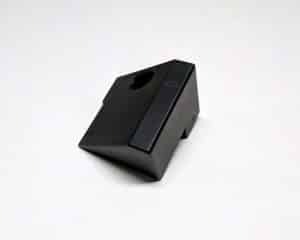 These are for securing the HDD caddy in one of the three available positions. As mentioned previously, there can be up to five storage drives with up to three being 3.5″ hard drives. For most micro-ATX builds this should prove to be more than enough. 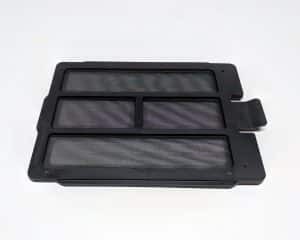 The three HDD trays are tool-less and slide out of the caddy by simply squeezing the two tabs and pulling. 3.5″ drives are attached to the trays by way of four pins. Simply expand the tray sideways, lay the drive in place, and close the tray back up. Note 2.5″ drives need to be secured using the included screws. The same is true for the SSD mount located behind the motherboard tray. 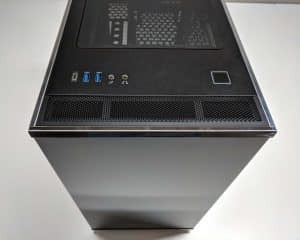 This case features a GPU support bracket. There are two screw holes and three slots to assist in adjusting this piece. These adjustments are useful as some GPU’s have backing plates and others do not. With the case fully stripped down to the chassis it is time to see how well this case houses both air and water cooled builds. This is where this review takes a turn for the worse. While attempting to install a motherboard it was discovered that the holes on the motherboard tray were not tapped. Not only the nine standoff holes but also the second GPU support hole as well as the two additional locations for the HDD caddy. 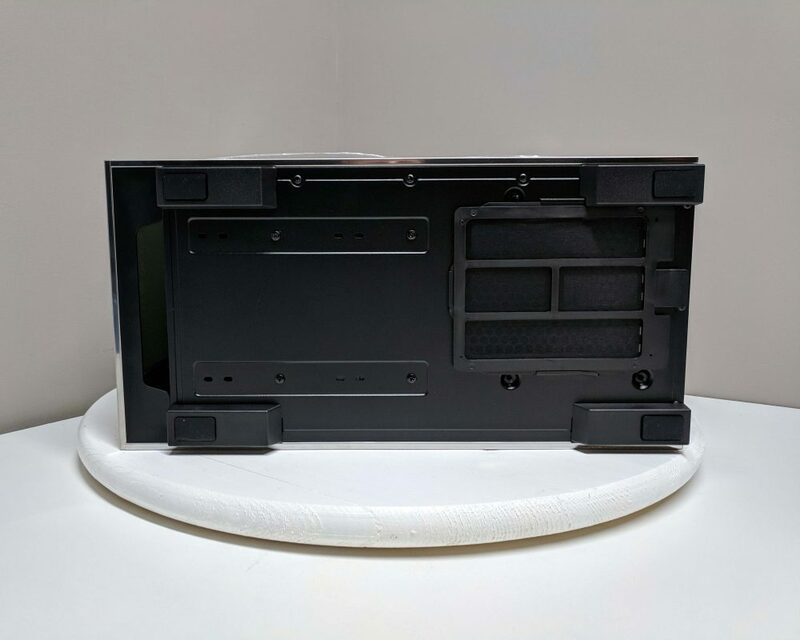 We reached out to SilverStone for comment and was told this is a design intention, all LD01 cases are like this, and they have received no reports of any problems. We recorded a video proving that the brass standoffs stripped when trying to tap the holes with the included standoffs and tool and feel this was a defect with this specific sample. We reached out to another reputable site that reviewed the case to compare notes over three weeks ago, but have not heard back. The only possible way to complete this review would be to tap the holes ourselves. This was done using a 6-32 tap. It was necessary to tap from the back of the case as the motherboard tray is not removable. I would also like to note that the two additional HDD caddy holes were never tapped due to proximity restrictions. 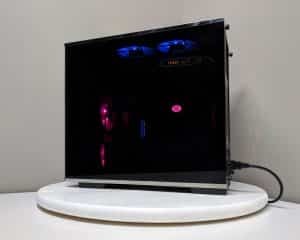 To simulate a custom water loop a 240 mm radiator was mounted to the top along with a pair of 25 mm thick fans. The maximum radiator thickness here is 35 mm with a standard dual slot GPU. Also, notice heat from the loop will be blown directly into the GPU. Another 240 mm radiator is located at the front. This time a closed loop cooler was used to show there is adequate hose length to reach the front, though it is tight. 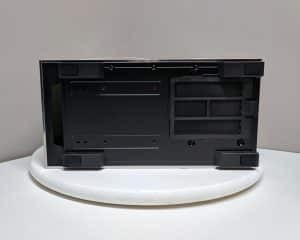 SilverStone did not include any mounting for water pumps so the use of double-sided tape would likely be necessary without modifying the case. 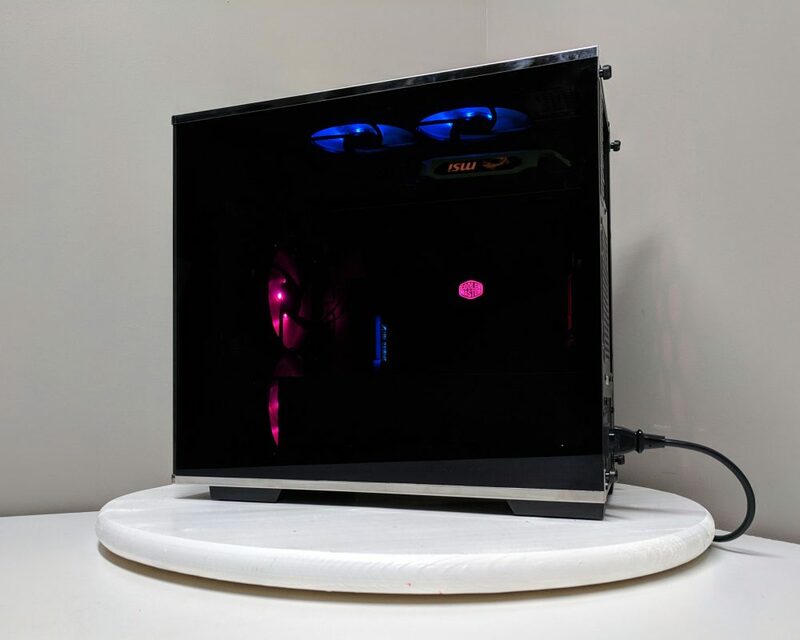 While this is not an ideal scenario, this case is completely capable of custom water cooling. RGB lighting stays mainly muted while in a bright setting due to the dark tint of the side panels. 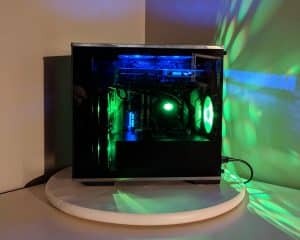 However, in a darker room, the RGB lighting really comes to life illuminating the entirety of the case and wherever the light can leak out. 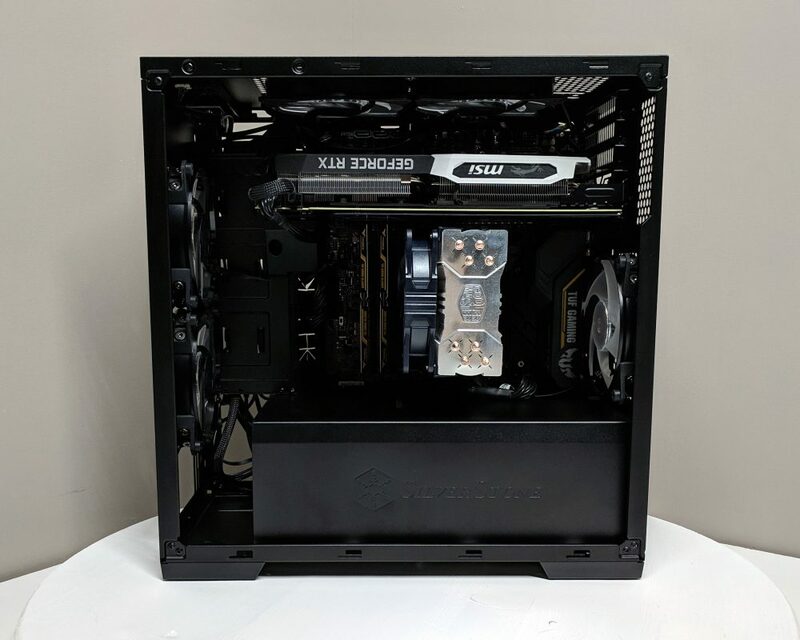 For the air-cooled build, we remove the water cooling components and add a popular tower style air cooler. 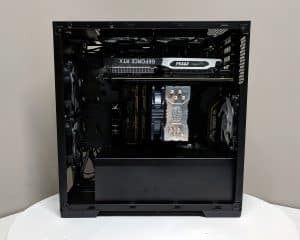 This type of configuration will represent the vast majority of enthusiast level builds and will be the platform for our thermal testing. With a build finally completed, we move on to testing air flow and thermal efficiency. As this case does not come with stock fans this testing will be completely subjective as different fans will provide differing results. Throughout the testing procedure, the case and CPU fans will be run at full speed. The CPU will be overclocked as high as possible while maintaining stability and without exceeding the thermal limits, then apply a load to the CPU and GPU using Aida64 Extreme and 3D Mark Firestrike for about a half hour. 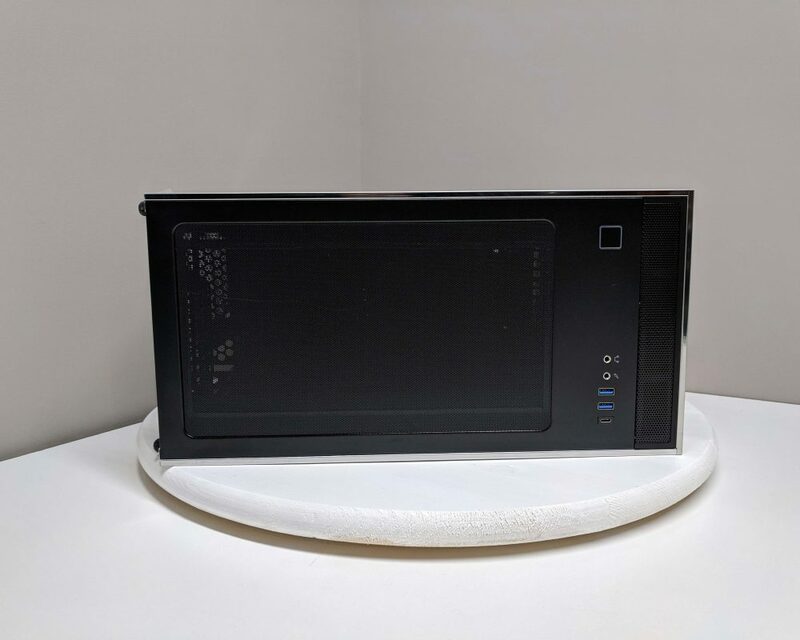 This will get the maximum temperature possible inside the case. Then remove the side panel and run Firestrike again to see if there is a temperature drop. 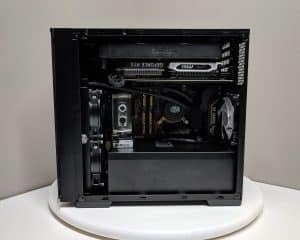 If the case is getting proper airflow then the case temperatures will remain within two degrees. For the first test, it will be run using two front intake fans and a rear exhaust fan. Then the test will be repeated, this time adding two additional intake fans at the top. This final test will be a best-case scenario. The results from the testing are consistent with what one would expect. The GPU did well with or without the top intake fans. though it should be noted that with the top intake fans added the GPU fans turn on far less. This can help with noise reduction if you have a particularly noisy GPU. The CPU benefited the most from the additional fans. 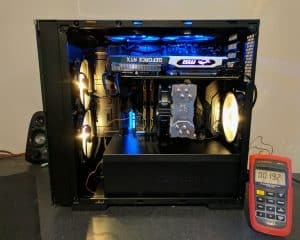 There was some thermal throttling without them but was due mainly from an aggressive overclock rather than anything relating to this case review. While the case did fail the thermal test without the top fans it only failed by a small margin and as mentioned earlier, could have had a completely different result with a different set of fans. As expected, we scrutinize every detail possible in all of our reviews to help identify any potential downfalls. The SilverStone Lucid LD01 is an absolutely beautiful case and has many features that make it attractive in both function and form, but it also has a few let-downs. 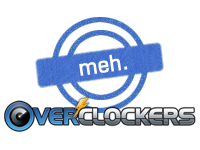 Primarily, the inability to install the motherboard standoffs. If, in fact, this is the normal condition for this case, as SilverStone stated, then this is a major failure. However unlikely, it is what we are being told. The usage of a USB 3.1 Gen1 Type-C in place of the newer Superspeed+ Gen2 is not a major issue but could be depending on motherboard selection and user needs. Finally, the exclusion of case fans is only an issue when factoring price. 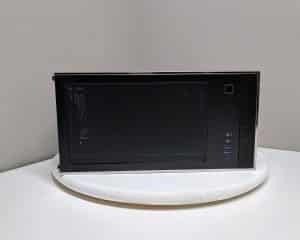 The SilverStone Lucid LD01 retails for $119.99 at Newegg and $114.99 at Amazon. After adding case fans, USB front adapters, etc one could easily be in the $200 range for a case that can be had much cheaper with similar features. Unfortunately, at this price point, along with the additional issues discovered during this review, there are likely better options for one to choose from.